5 Signs Your Kids Might Be Growing Up Gamers! 1. Your kid has a sketchbook is full of game design ideas.. complete with components breakdown! Katie's "list" of components for prototyping her new game "Sea"
3. Your little one gives tactical advice to your wargame opponent about your weaknesses and comes up with a winning move! 4. Your kids get up before you to sneak into the gameroom and play games together without you and your silly "rules"
Jack telling Katie "this how you do it!" Can we paint minis today Dad, please? Please? At ages 2 and 5 our kids have fully embraced our gaming lifestyle. They listen to gaming podcasts with me, never ever turn down an invitation to play a game, and Katie even asked if we could go on a family trip to a gaming convention this summer. What evidence do you have that your gamer training is paying off with the little ones? Are they growing up gamers too? We'd love to hear from you! Fine, I'll admit it. I'm a closet steampunk. Which is -not- to say that I have closet full of spiffy custom or DIY quasi-period threads, have a computer with a wicked lacquered wood and brass or go to conventions and speak in my best imitation old-school Queen's English (though I wish I did!). What I mean to say is that I have a fondness for the aesthetic, read steampunk fiction and lurk in steampunk forums. There's some great creativity going on there, and it's worth taking a look at. So, what is it, anyway? Steampunk is usually represented as Victorian futurism... that is to say, mostly contemporary people trying to imagine a future that Victorian-era people might have foreseen. Clear as mud? Okay, okay... think of heroes in top hats and/or corsets riding dirigibles, fighting mad scientists with death rays. Or in steam powered exoskeletons. Not all steampunk is necessarily Victorian-based... a lot can take place in a fantasy setting, with the primary steampunkiness coming in technology having the flavor of that era but generations ahead in function and complexity. I'm including a sample reading list at the end for those of you interested in looking at the literary genre. Off the page, you'll see steampunk enthusiasts at conventions, making really cool stuff and/or online in various forums devoted to the subject. Without a doubt, steampunks are the best-dressed geeks around (and I say geek affectionately, as I consider myself one!). It's hard to find a group of people so obsessed about their wardrobe... or their cool toys! A browse through the interwebs will reveal to you a very active bunch of people making amazing case modifications to computers, creating amazing clothing, action figures and mock weaponry. And T-shirts, presumably for when they're not wearing corsets or waistcoats. But, all that aside... what about gaming? Quite a few games recently have incorporated steampunk into their theme over the last few years, to varying degrees. I am not going to try to go over all of these; this is not a comprehensive overview. But the ones I'm including here are games that have caught my eye and/or crossed my game table. So here they are... a delightful smattering of ludological diversions that, perchance, you may ask friends to indulge in should they come a-calling! Girl Genius: The Works: This is a card game based on the Hugo Award-winning webcomic and graphic novel series by Phil & Kaja Foglio. I must say that I follow the webcomic faithfully, and if you haven't read it, I recommend starting from the beginning. The game has you lay out cards in a gear-like pattern. On your turn, you rotate a card and check to see if any of the symbols match surrounding cards; if it does, you remove the card ("pop" the card) and perform the listed action, for good or ill. Then you add it to your score pile and replace it with a card from your hand. This continues until you hit 100 points. As a game, it's decent. What I like best is the Foglio art of characters from the Girl Genius storyline. Red November: The only truly cooperative game on the list, Red November casts the players as the drunken gnomish crew of a submarine that is both falling apart and being pursued by a kraken. I had a good time playing it. What I think is really innovative about the game is how it tracks time. The board is framed with a time counter. The person whose token is farthest back on the time track takes the next turn. You have discretion in how much time you want to spend trying to repair something (or another task); the more time you spend, the higher likelihood you'll be successful. It's great to have as a consideration, and an excellent way to ramp up the tension. Overall, not the best of the cooperative games out there, but very good, very funny and very steampunk. Around the World in 80 Days: Based on Jules Verne's classic and a Spiel des Jahres nominee, Around the World in 80 Days isn't necessarily the strongest steampunk-themed game, but I feel it belongs here. It's a race against time, and against other players. You collect various types of travel cards and spend them to advance to the next location. It's pretty simple, and it's pretty accessible for non-gamers. Aether Captains: I've heard positive things about this game but have not yet tried it. It's a solitaire dice game where you are the pilot of a war zeppelin fighting air pirates. I primarily included it because... it's hard to get more steampunk than war zeppelins. Enough said. Ascension: We reviewed this earlier, but I wanted to include this as a good example of a fantasy setting that incorporates steampunk. The Mechana faction in this game are all about the clockwork and anachronistic technology. Cards like the Watchmaker's Altar, Rocket Courier X-99 and Reactor Monk are examples. A solid and fast-playing game in the deckbuilding genre, Ascension is a good addition to any game shelf. 011: This is one that caught my eye for it's excellent art. 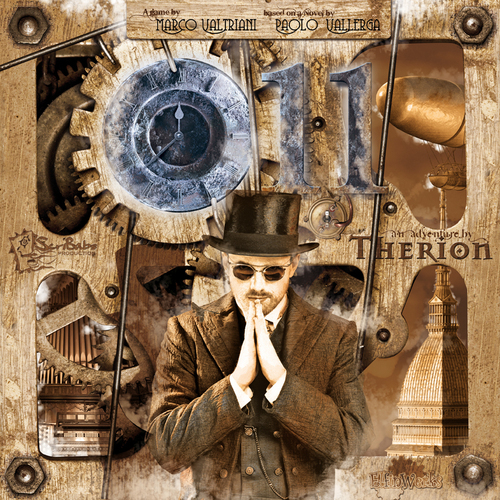 The only game that has not yet been released, it is based on a novel and the game itself is a collaboration between game designers and a symphonic metal band called Therion. The BoardGameGeek entry has some card images and I recommend checking them out. They went all out with the steampunk theme, and photography figures heavily into the graphic design. Based on the description, it appears to be "competitive cooperative"- meaning that everyone must work together, but in the end one will win. Castle Panic has a similar mechanic. So... that's all I know about the game. But it's one that I'm very interested in trying. Etherscope: Etherscope is the first roleplaying game on the list. Also a game I haven't played, but I've browsed the books and am fascinated. 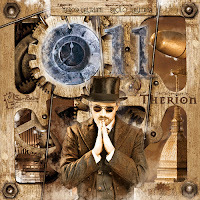 Based on the d20 Open Game License (OGL), it combines elements of steampunk and cyberpunk. From my readings, it seems to combine the best elements of Shadowrun with the standard tropes of steampunk. I keep meaning to pick up used copies of the core books, but have never got around to it. Lady Blackbird: This is an indie RPG module with a light rules system that looks a lot like The Burning Wheel (I think it is some sort of BW Lite, but I could be wrong). The module seems very flavorful, and has very interesting pregenerated characters. It's a free download, so try it out! This was recommended for inclusion by Joseph Giddings. Thanks, Joseph! Airship Pirates: This is a new RPG that I'm looking forward to trying out. The system it uses is from the Victoriana 2nd Edition (another steampunk RPG I missed!). I know very little of this other than that it is based off the songs of Abney Park. The art that I've seen for this is pretty amazing and I can't wait to locate a copy. -Iron Kingdoms RPG: The longest-running game I was dungeon master for was set in the Iron Kingdoms. In addition to having some of the best-written setting material, one of the things I like about it was that it did a great job of incorporating mechanical magic (mechanica) into the setting. Though mechanica items were significantly cheaper than standard magical ones that did the same effect, they were powered by batteries. Well, accumulators... which are magical batteries. New classes for the d20 system included Gun Mages (as awesome as they sound! ), Arcane Mechaniks, Bodgers (sort of a junker, sort of roguish) and Fell Callers (a race-specific battle bard). And, later on, warcasters. warcasters are the rock stars of the Iron Kingdoms... mages (mostly) in steam-powered armor leading warjacks and others into battle. An amazing setting, and worth a look. -Warmachine: Warmachine (and its sister game, Hordes) is a miniature skirmish game. It pits battlegroups led by warcasters (warlocks for Hordes) against each other. Five factions struggle for control of the Iron Kingdoms. One of the most popular mini games around. I personally own and have painted loads of these minis for my roleplaying game, but do not actually play it. I do, however, own most of the books, and mine these for roleplaying material. -Grind: Grind is a game based on the Warmachine universe where teams of Warjacks play an arena combat game, trying to score goals with a huge spiked ball. I own it and keep meaning to play it. Mostly, though, I just got it because the plastic warjack minis are the same scale as Warmachine and it's a cheap way to get new warjacks (Cygnar and Khador factions). -Infernal Contraption: Privateer Press a few years back decided to release a line of games called Bodgers. They all feature gobber (goblin) bodgers and their shenanigans. This one is a race to complete crazy machines by raiding junk piles and connecting them to each other and to appropriate power sources. I wanted to like this one, but beyond theme (and great art! ), it's not spectacular. I hope you enjoyed this! Do you have any experience with the genre, or have any games, books or anything else to share about it? Leave us a comment! The nice folks over at Pressman Toy sent us their new game Diary of a Wimpy Kid: The Cheese Touch Game to check out, and I really had no idea what to expect. I’ve looked the Diary of a Wimpy Kid books before and thought they were cute, and have even heard good things about them from my kid friends, but they aren’t something we’ve read… yet. The graphics and style of this game has all the cuteness and fun flavor of the book series, and I’m sure fans will have a lot to identify with. As an outsider to the series, we found the characters and art to be interesting and it definitely piqued our interest in the stories behind them... but you don't need to read the books to enjoy this game. After looking it over for a few minutes I was super excited to give this game a try because it looked like a simple, streamlined, and clever party-style game (Cranium-esq) that is playable by all ages. Sweet! This game did not disappoint. Bottom line is we’ve had a lot of fun playing it, and it’s one that will definitely see a lot of table time in the future. ﻿﻿﻿﻿The basic game play consists of rolling a die, moving your piece, and drawing a card of the appropriate type based on where you land. The card varieties each offer a different type of challenge, ranging from guessing what other people will answer to acting out requested tasks in a specific way, with some random elements thrown in. Success on the challenge usually results in moving forward on the board, while failure results in obtaining “the Cheese Touch” (which I think is supposed to be equivalent to “cooties” or something??). First one to the finish line wins, with the kicker that you can’t win if you have the Cheese Touch. The pacing seems just about right, you are usually moving forward pretty quickly, the track isn’t too long, and there are lots of ways for the Cheese Touch to be passed around. The thing I enjoyed best about this game is that it encourages you to get to know each other better through clever questions, without being too complicated, long, or “boring” for young kids. Random hugs are part of this game! Seriously! ﻿﻿Our first play through included me, Randy, Katie, and a couple of adult friends that were over visiting. When friends come over Katie often wants to be included in gaming, but finding a game that offers a fun experience for a bunch of adults and one little kid isn’t the easiest thing in the world. Our lovely friends have indulged Katie and played many games of Candyland, Disney Yahtzee, and other kid favorites over the years; but I’ve never seen the adults enjoying themselves as much as we all did playing Cheese Touch. Laughter, good conversation, and full engagement from Katie AND the grownups were hallmarks of this game. Favorite questions involved trying to figure out who Katie would think was the most likely to survive in the wilderness, admitting the longest we'd each gone without a bath, guessing which pet peeve belonged to which grown-up, and trying to act out swimming and eating "incorrectly". We had fun and enjoyed the experience, all while learning a little more about each other. We highly recommend this game for a fun family experience; it’s simple, light-hearted, and offers a solid party game experience in a cute little package. An insta-hit, loved by Katie and the grown-ups! Have at thee, readers! I'm going to start this off by asking, who doesn't have a great memory somewhere of some great wacky dungeon crawl, whether it was Dungeons & Dragons, HeroQuest, Talisman or any number of similar themed games? Heck, maybe even Munchkin on a good night. Well, our offering today is something in that vein. The friendly people over at Minion Games were nice enough to provide us with a review copy of their crazy dungeon crawl game, Those Pesky Humans! Here's our thoughts on it. As you can gather from the title, it is definitely intended to be light-hearted. It is playable with two to four players, with there being two teams. The first team is the band of adventurers delving through the dungeon, while the second team is the ogre and his minions, whose goal is to eliminate the humans. I'm a big fan of turning standard tropes on their ear and getting a new perspective, and this one does that. The idea that at least one player plays the dungeon denizens is not new (I have not played them, but Dungeonville and Dungeon Lords have similar themes), but it is definitely fun. It's quirky, and has the art to back it up. Speaking of art... I enjoy this game's art. It's a fun and cartoony style, poking fun at standard fantasy stereotypes. I like it that all the player and monster pieces have front view and rear view art. It would be extremely easy (and cost-cutting) to make both sides of the standing cardboard tokens the same, but I appreciate the extra effort they took to make it a higher-quality game. Style-wise, it's not nearly as over-the-top slapstick like John Kovalic's Munchkin art, but is amusing nonetheless. Anyone who has any experience with the fantasy genre should immediately take to the great illustrations in this game. In the components department, this game has a lot of them. As it says on the box, "Over 200 pesky pieces!". The player and monster tokens I mentioned before are cardboard pieces fit into plastic stands. There are also standing door tokens, item and condition tokens, map hexes and card decks for each team, plus smaller ability decks for the adventurers. On the subject of the cards... this is where I need to weigh in and say that the quality of the cards is lacking a bit. The stock used for the cards doesn't shuffle well and shows wear after even minimal use. We tend to not sleeve our game cards as many do, but this one would be a good candidate for sleeving (Magic: The Gathering-sized sleeves should work). Using card sleeves would definitely solve both the shuffling and wear issues, so please consider that. Otherwise, no complaints about the other pieces; everything else is high-quality printing on appropriate stock. On to gameplay. Gameplay is pretty straightforward; each character or monster is moved and an action is taken with each every turn. The goal of the humans is to find the three legendary gems and get back out; the goal of the monsters is to defeat all the humans. Combat is pretty simple; each side rolls, add a stat and compares totals. It's a dungeon crawl game, and you'll find the standard fare of monsters, items, traps and interesting room effects. In that sense, it does a far better job than Castle Ravenloft. It does have a longish play time, and for this type of game I feel it is a little outside what I consider the "sweet spot" in the fun-versus-time spent area in most gaming situations. I'm under the impression, though, that this will be a great one to pull out when some younger cousins come to visit and want to play a mad dungeon romp. So that's what we think. There's a lot to like about the game. The theme and art do a great deal for it. Gameplay flows reasonably well. A few years ago, I would have loved this game instead of just liking it. Longer play times like this I usually reserve for either heavier strategy games, or for roleplaying games. I recommend this game for people looking for a crazy D&D-like experience without having to worry about making characters. As I mentioned before, I plan on bringing this to the table when my wife's late teen/early twentysomething cousins roll into town, which is exactly the experience they tend to shoot for. I'd like to wrap up with a big "Thank you!" to Minion Games for providing this for us. They have some interesting games available now and on the horizon, so be sure to stop by their website! Problem -solving is in this game! Yep. That’s what the game is all about to me. There are two players in Mastermind , the codemaster and the codebreaker. The codemaster puts out a secret code of colored big pegs. Then the codemaster needs to make sure to keep their code secret and also put out little pegs for the codebreaker so they know some information. The codebreaker tries to figure out the code by guessing the pattern. Like if my mom puts out green-white-purple-orange and she is the codebreaker, I would look at my secret code and see how many pegs she has that are the right color in the right places, and how many are the right color in the wrong place and put out little pegs for that. You have to get them exactly right, in the right place. When you are the codemaster you have to be really smart about your code because the other person might guess it in only one turn, so it’s good to be tricky. Also when you are the code breaker you need to use your thinking brain to put together the information you got from all of your other guesses and think-think-think hard to figure out the code. When I’m the codemaster I like to trace a line with my finger from each color in the guess to my secret code to make sure I’m putting out the exact right little white and red pegs. I don’t want give the codebreaker the wrong information! The strategy is to look at everything all together. My mom calls that logic. I think that means to look back at your previous moves to make sure you don’t just guess the same wrong thing. I’m learning how to use logic to solve the mystery of the code! I like this game one hundred and fifty nine! That means I like it like almost infinity. It might even be one of my favorite games in the whole world of games. Totally. It’s different than my other favorite game, which is of course Settlers of Catan. I learned to play Mastermind yesterday and if you put all the times I’ve played it so far together I’ve played it about 16 times already! I want to say thank you to the nice people at Pressman Toy for sending us all those games. I hope they are having a happy day like me, because I have new games to play. I hope all you blog readers have lots of happy games to play too. Have fun playing games! First off, I wanted to say than to everyone for the encouragement, cautionary tales, excitement, networking opportunities, and general interest in my previous post about my education/career/life goals and how it relates to gaming. It’s very exciting to hear from so many enthusiastic folks, and I’ve had the pleasure of sharing some of the literature I’ve been reviewing with others who are looking for academically credible “evidence” that games provide positive benefits. I read a lot of articles about games research; I’m absolutely fascinated. I want to know what studies have been done, what the findings were, and what possible implications are considered. I am personally and professionally interested in the connections made and applications found for this type of research. I have been scouring databases and amassing a collection of articles on everything game related, and there is some really important work I’ve dug out. Lately I keep running across a lot of cross-references to a specific study that had some pretty amazing results, so I thought I’d share it with you all! Disclaimer: This is a blog post providing a quick and simple overview of the article with lots of personal commentary added in and in no way constitutes a scholarly analysis of the content, the study methodology, or the results. For any academic or professional purposes you should read the original article! There’s a handy reference below. Ok ok, enough rambling. Let’s get to the good part. A couple years back (2008) an article was published entitled “Playing linear numerical board games promotes low-income children’s numerical development”. In this journal article, the authors explain that they conducted a two-part experiment involving kids and games then discuss the results. numerical game", although NOT the one used in this experiement. The first experiment showed that preschoolers from low-income households were not as proficient at placing numbers in a number line as kids who came from higher income families. This is not particularly surprising, this type of research has been around for a while, and is one of the reasons early intervention programs like Head Start exist. It’s an important issue facing teachers, how do we provide a quality education for all students when some are entering school with far less-developed skills? ﻿﻿ The second experiment is where things get interesting. The researchers hypothesized that playing linear numerical board games (a game with a board that has numbered spaces in a line) might help the low-income kids “catch up” to their middle-income peers. The way they tested this was to take two groups of low-income kids and have each group play a game for 4 different 15-minute sessions within a period of 2 weeks. It appears as though a specific game (not commercially available) was designed for this experiement which consisted of a track 10 spaces long, and the kids played by moving a token 1 or 2 spaces based upon the result of a spinner. The control group played a color-based version of the game and the test group played a game where they moved pieces along numbered spaces. Not the most creative or engaging game I could think of... but that's what they used. Here’s where it gets exciting, it worked! The kids playing the number game greatly improved their numerical skills from pre- to post- test, while the kids playing the color-based game did not. After ONLY 1 HOUR of total time playing the game the low-income kids in the test group demonstrated the same level of proficiency as the middle-income kids in the first experiment! They were completely "caught up" to their peers just by playing a game 4 times! The possible implications here are vast; we’re looking at an inexpensive, simple, and highly efficient way to reduce the gap in early numerical understanding in preschoolers. This is a potentially invaluable and very basic intervention that could be widely adopted. To be fair, this study is somewhat limited in scope. The control was a color-based board game and not some other number learning activity, which makes me wonder if the same results would be seen had the students spent the four 15-minute sessions doing another number related activity? Flash cards? Numbered manipulatives? Is the board game the most effective way to achieve these results? number-based interventions provide the same results? ﻿﻿﻿﻿So, to sum up... it looks like maybe all we need to do to close the achievement gap is get kids playing more games!